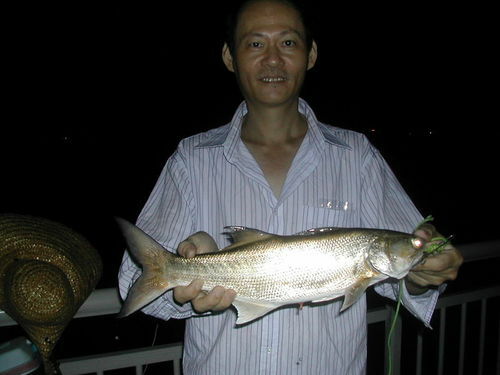 Ah Chuan caught this threadfin about a kilo plus this evening when the tide is mid way up. I use my squid net to scoop it up for him. Caught this barracuda about 1kg plus when the tide is about to turn up. It took the bait and get hooked on the side of the mouth. Easily wind in and lift it up. The fish I gave to a friend later on. 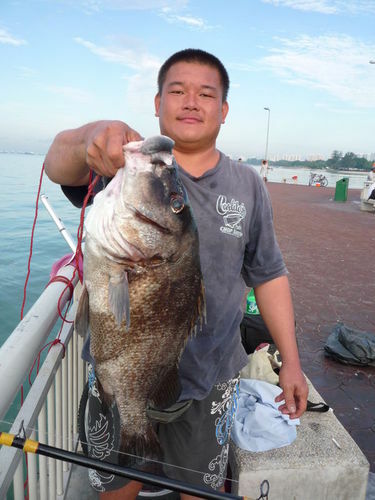 Ah An caught this 4.2kg Black Sweetlip or black kaci with a handline just below the jetty. Bait is a dead tamban. Went for a short trip tonight and caught this small threadfin. It quietly took my bait and slack my line. It was when the tide was not moving but about to turn up. I saw the line slack and pickup the rod to strike. It didn’t struggle much. I wind it near to the jetty and ask my friend to get my squid net to scoop it up.